There are very strict laws and regulations when it comes to getting a motorcycle license in Massachusetts and New Hampshire. However, regardless of how safe you are on the roads with your motorcycle, you can still become involved in a motorcycle accident. There are a number of reasons why motorcyclists are involved in a high number of accidents compared to car accidents. Car drivers may not see them or many car drivers simply disregard motorcyclists and put them at risks without realizing it. When a motorcyclist has been injured in a motorcycle accident, they should never just assume they may be culpable because they were on a bike. Motorcyclists have the same rights as anyone else on the road and deserve the same protections. If you have been the victim of motorcycle accident, let the law firm of George C. Malonis fight to protect those rights and get you the settlement you deserve. 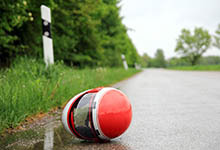 Motorcyclists are apt to suffer more serious injuries when hit by someone on the road. Because they are more exposed and not as protected as someone in a car, a motorcycle accident victim may have to contend with head injuries, broken bones, lacerations, spinal cord injuries or other injuries. These injuries can lead to missed work, long expensive hospital stays, long recovery times and rehabilitation needs, and can even put a great strain on families, financially and emotionally. A skilled and compassionate Massachusetts and New Hampshire motorcycle accident attorney from the law firm of George C. Malonis is your best bet for recovering the settlement and damages you need and deserve after a debilitating accident. Our firm is adept at negotiating with insurance companies and can get you the settlement you need, possibly without ever going to court. Having Massachusetts injury attorney George C. Malonis on your side shows them you know your rights and you have found the right team to fight for those rights. We are able to investigate the scene and details of the motorcycle accident, interview witnesses, gather evidence, and gather the proper medical and employment documentation that outlines the damages you have suffered. With a desire to see you get what you need combined with the determination to prevent insurance companies from taking advantage of victims, George C. Malonis is the legal advocate who will never stop fighting for you until you get what you need and deserve. The first step to putting your motorcycle accident behind you in a fair and timely manner is to contact George C. Malonis. This information on this website is not intended to create, and receipt or viewing of this information does not constitute, an attorney client relationship.